KIEV, Ukraine -- Ukraine's pro-Russian rebels rushed Sunday to dispel speculation that a bloody internal battle for control of Moscow's money was behind the gangland-style slaying of a top warlord. 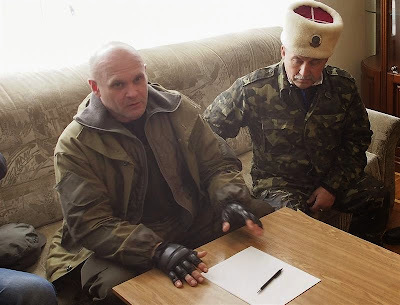 Pro-Russian rebels commander Aleksey Mozgovoi (L) speaking with journalists in Luhansk, Ukraine, on 14 April 2014. Prizrak (Ghost) brigade commander Alexei Mozgovoi and at least six others -- including his press secretary and armed guards -- were shot dead Saturday while travelling in an area under his control in the renegade eastern province of Luhansk. Separatist officials said his convoy of at least two vehicles was first struck by a bomb. The survivors were then mowed down in a hail of bullets near the spot where Mozgovoi survived another assassination attempt in March. Mozgovoi was long believed to have run afoul of Luhansk's self-proclaimed leader Igor Plotnitsky and some key officials in the Kremlin. Yet Plotnitsky tried quickly to quash talk of a potentially fatal rift emerging in the militants' loosely-organised ranks. "The attack on Alexei Mozgovoi and his comrades-in-arms was an attack on all of us -- people who defend the right for the (separatist region) to exist," Plotnitsky told his administration's official website. "I mourn together with all those who knew Alexei Borisovich Mozgovoi and those who walked this journey together with him." Mozgovoi played a central role in momentum-swinging battles that forced pro-Western President Petro Poroshenko to sue for peace on two occasions. His trimmed goatee and penetrating gaze disguised an authoritarian character and history of insubordination. The former folk choir singer and poet -- believed to be around 40 -- resisted the terms of a February truce deal that permitted only limited self-rule in rebel-held lands. Mozgovoi also featured on a US blacklist for organising a summary court system that targeted those either backing Kiev or practising Western lifestyles. "If tomorrow I see another young woman in a cafe or bar, she will be arrested," he told reporters last year. "A woman must be the keeper of the hearth, a mother. And what kind of mother does she become after bars?" Defence officials in Kiev denied involvement in Mozgovoi's slaying and pointed the finger at his separatist foes. "A sectarian battle between the fighters is continuing on the occupied territories of Luhansk," presidential administration spokesman Oleksandr Motuzyanyk told journalists. "The head of the Prizrak criminal gang has long been in conflict with the leadership of the so-called Luhansk People's Republic." Some prominent rebels admitted that Mozgovoi was at loggerheads with the militants' political elite. "We all know about these unpleasant relations, which were out in the open," separatist peace negotiator Denis Pushilin told Russia's RIA Novosti news agency. "This was a targeted attempt (by Kiev) to unsettle the situation from within." Luhansk prosecutor Sergei Gorenko also reported that his initial findings implicated a pro-Kiev "sabotage force". And pro-Russian police chief Sergei Kozlov said Ukrainian "reconnaissance and sabotage units" had recently stepped up operations across lands under the insurgents' control. Several senior commanders have been shot dead under mysterious circumstances in recent months. These slayings and President Vladimir Putin's decision to accept the February agreement have fuelled speculation that Moscow no longer planned to either annex or set up an independent state in the industrial east of Ukraine. Recent comments from rebels involved in the Kremlin's secret "Novorossiya" (New Russia) project suggest that at least some of their Russian funding has been cut off. Moscow resolutely denies backing the guerrillas and calls Russians who took part in clashes that have claimed nearly 6,300 lives in 13 months "volunteers".